Home > Fantastic Dollar Point Cabin! 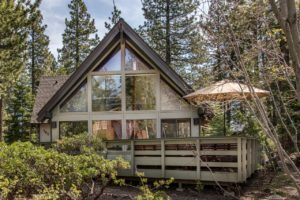 Star gaze from your own hot tub or take advantage of the highly desirable Dollar Point Association amenities which include pier on the north shore of Lake Tahoe, tennis courts and a pool – this Dollar Point cabin has a lot to offer! Chalet-style with vaulted ceilings, spacious loft, Great Room with lots of natural sunlight, and a large storage room. The home is situated on a level lot with a wrap-around deck, perfect for entertaining and relaxing. It has been lovingly decorated and cared for. Just minutes away from shopping, dining and services in Tahoe City, the location is extremely convenient, yet in a very quiet neighborhood. Hop on the great North & West Shore bike path system, go a few minutes to a massive network of Nordic Skiing or mountain bike trails starting at Tahoe X/C, or access extensive hiking trails off the nearby Tahoe Rim Trail. Ski at Squaw Valley/Alpine Meadows, Homewood Ski Area, or any of Tahoe’s eight other ski resorts. Paddle board, kayak, power boat, sail, swim…a lifetime of outdoor activities is right on your doorstep. Even get a coveted front row seat to Tahoe City’s 4th of July fireworks!